Consolidated Credit is a nonprofit organization that provides A+ BBB rated credit counseling and debt relief services to consumers nationwide. They provide competitive rates, transparent pricing and additional educational resources including blogs and web seminars. 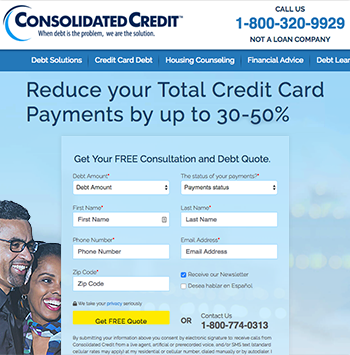 Founded in 1993, Consolidated Credit has assisted over 6.5 million consumers with getting out of debt through their credit counseling and debt management planning services. Consolidated Credit provides a free consultation during which certified credit counselors examine your budget and debt before offering you budgeting advice and debt management strategies. If you are in need of a debt management plan to pay off your credit cards, they will design a personalized repayment plan with monthly payments to fit your needs. Their goal is to combine your credit card debts into monthly payments with a lower interest rate than your current loans. Consolidated Credit can also assist with financial advice and counseling regarding home purchases (covering first-time homebuyers all the way to reverse mortgage options for seniors). 25+ years of experience: Consolidated Credit has been in the credit counseling and debt relief business since 1993. Won't hurt your credit score: Unlike other debt relief options like debt settlement or bankruptcy (which can drop your credit significantly), Consolidated Credit will not negatively impact your credit score. Highly accredited service: Consolidated Credit has many industry accreditations, including an ISO certification and an FCAA (Financial Counseling Association of America) accreditation. Award winning service: Consolidated Credit was the recipient of the EIFLE Nonprofit Organization of the Year in 2012 and are currently a Certified ISO 9001 Company. Certified debt counselors: All debt counselors are CPFC certified. The president of Consolidated Credit, Gary Herman, has also trained as a certified credit counselor and is the vice president of FCAA, which ensures that debt relief companies provide the best service. Free initial consultation: Simply fill out a form on the Consolidated Credit website. Excellent customer service: Customers reported great customer service from professional, friendly, and knowledgeable company representatives. Additional resources: Consolidated Credit offers extra resources such as blogs, web seminars, debt-to-income ratio and credit score cost calculators, and a community outreach program for extra financial education. Their website lacks transparency, specifically regarding pricing for their credit counseling services and debt management plans. Customers are instead asked to call or apply online to find out more. As a non-profit agency, Consolidated Credit's fees and pricing are dictated/regulated/governed by the states they operate in. Consolidated Credit charges an upfront fee ranging between $0 - $49. The monthly fee is $0 - $69. Credit card debt can be reduced by 30% to 50%. There is no minimum debt required. What is the minimum debt needed to qualify for Consolidated Credit? There is no minimum debt required to enroll. What is the difference between a debt management program and a debt settlement program? A debt management program allows you to pay off what is owed in a manageable way, by paying a lower interest rate to quickly rid yourself of debt. A debt settlement program settles your debt for less than the full amount you owe; however, even though this closes the account, you will see a 7-year credit report penalty for all the settled debts. Can I pay an extra amount during the month to pay off my credit card debt sooner? Yes. You simply have to call Consolidated Credit and speak with a representative who can assist you in posting the extra payment. What are Consolidated Credit's business hours? Consolidated Credit's team of credit counselors are available from Monday through Thursday 8 am to 10 pm EST, Friday and Saturday 8 am to 8 pm EST, Sunday 9 am to 5 pm EST. Where are the Consolidated Credit offices located? Consolidated Credit's address is 5701 West Sunrise Blvd, Fort Lauderdale, Florida 33313.